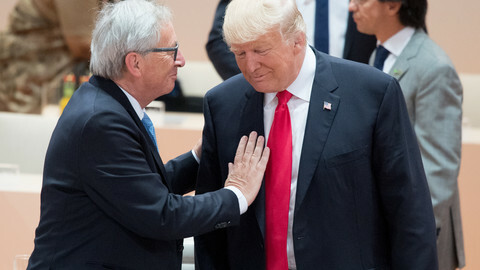 "I had the intention to make a deal today and we made a deal today," European Commission president Jean-Claude Juncker said on Wednesday (25 July), after meeting US president Donald Trump in the White House. 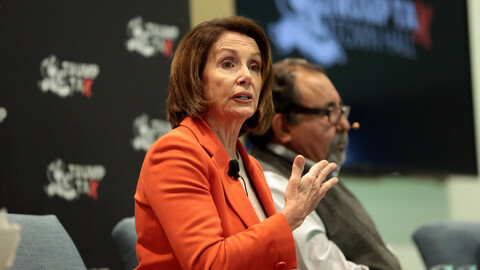 In a surprise move, the two leaders agreed to start negotiating a deal to abolish tariffs, non-tariff barriers and subsidies on industrial goods, as well as increase trade in services, chemicals, pharmaceuticals and medical products. 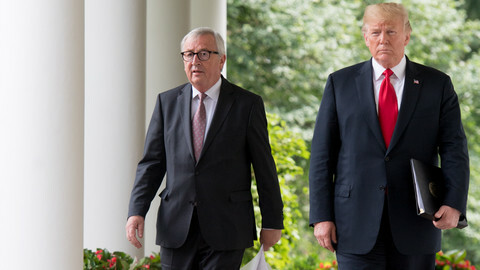 Trump agreed not to impose additional tariffs on EU cars, and Juncker said the EU was ready to buy more US soybeans and liquefied natural gas (LNG). "This was a very big day for free and fair trade," Trump said, after weeks of accusing Europeans of "taking advantage" of the US on trade. But while Trump boasted later that the EU will "start buying soybeans from our great farmers immediately" and that it will buy "vast amounts of LNG! ", many noted that Juncker left Washington with US tariffs on steel and aluminium still in place. The EU had repeated so far that it would not negotiate "with a gun to the head". So did Juncker yield under pressure, or did the seasoned EU leader trick the US president? 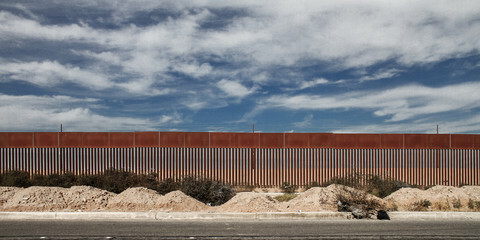 A first way to look at the White House agreement is through the commission's own eyes. "The outcome is a situation where both sides win", a commission spokesman said on Thursday, adding that Juncker has achieved his goals: "de-escalate the situation, avoid new tariffs coming into place, reassess the existing tariffs measures, and identify a number of areas where cooperation can be strengthened and putting in place a structure for such dialogue and cooperation." 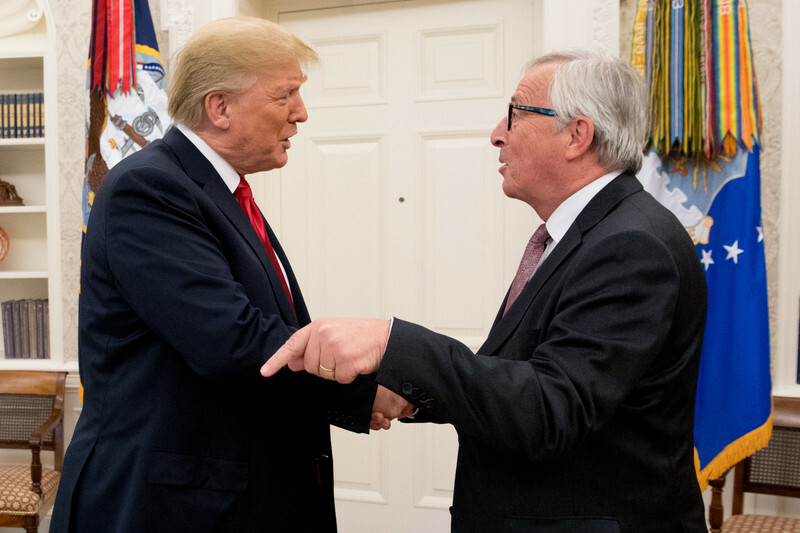 Just over a week after the US president said that the EU was a "foe", Juncker and Trump put transatlantic relations on track, and avoided the full-blown trade war that would have been almost unavoidable had Trump imposed tariffs on EU cars. Seen from a short-term necessity point of view, the Juncker-Trump statement is a success for the EU - and hailed as such by Germany, the country that would have had the most to lose. German economy minister Peter Altmaier, one of chancellor Angela Merkel's closest allies, welcomed a "breakthrough that can avoid trade war and save millions of jobs." But the price to avoid tariffs on cars - above all on German cars - may seem a high one to pay. EU leaders had said in May that they were ready to discuss ways to "improve reciprocal market access" for industrial products, as well a US LNG supply and joint effort to reform the World Trade Organization (WTO) - but only after Trump grants the EU a permanent exemption on steel and aluminium tariffs. The commission spokesman, who said on Thursday that Juncker went to Washington "in full harmony with the leaders", declined to explain why the EU crossed its red line and whether Trump gave any guarantees on a future lifting of the existing tariffs. A working group will be put in place in the coming days and will prepare a report, due in November, fleshing out the possibilities for an agreement - two years after the failure of TTIP, the free trade deal the US and the EU tried to negotiate for three years. But an EU official admitted that trade talks would not be jeopardised if tariffs on steel and aluminium remained in place. He noted that even if lifting them would be "a good signal," there was "no particular link to any other process" agreed by the two leaders. "The Trump-Juncker meeting has yielded no commitment from the US to abolish the illegal tariffs on steel and aluminium," Bernd Lange, the chairman of the European Parliament international trade committee, said in a statement. Noting that that the threat of tariffs on cars remained, he added that "this is not a good basis for negotiations". By agreeing to trade talks while renouncing to its red lines on tariffs, the EU granted a political and communication victory to Trump, who has said earlier this week that the EU was "coming to negotiate" and that he would try to make it "drop all tariffs, barriers and subsidies." Europeans, who have condemned Trump for weakening the rules-based multilateral order by imposing tariffs and threatening of new ones for supposed national security reasons, have vindicated Trump's strategy - at least to some extent. But behind the words and Trump's enthusiasm - "soybeans are a big deal," he said - what the EU conceded remains unclear. Europeans will buy US soybeans, which are currently hit by Chinese counter-tariffs and need new export markets, but neither Juncker nor member states can guarantee the volumes or the value of the future imports. The EU official noted that EU farmers have "an enormous need" of soybean as source of proteins to raise and produce pigs, chicken, milk and some beef, and that the EU cannot produce it itself for climate reasons. But he insisted that the EU "will not import more than we need," and that trade will depend on the market. 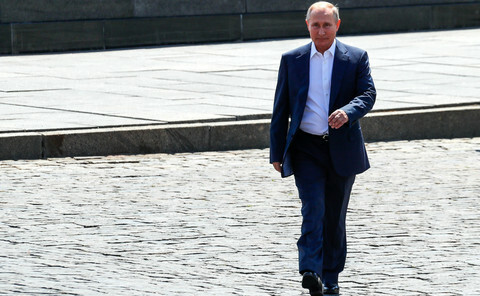 "We are not going to turn into a Soviet-style economy," he said. Contrary to what Trump said, the EU did not commit to buy "vast amounts of LNG"
"It's a declaration of intent, not a commitment," the EU official said. While US gas, mainly shale gas, is cheap in the US, its price increases when it is exported because of liquefaction and transport costs, as well as investment needed to build terminals. "There is a market dimension," the official said, suggesting that US LNG might not be so attractive to private operators. In their common statement, Juncker and Trump also agreed not to "go against [its] spirit" by taking aggressive measures, "unless either party terminates the negotiations." By this clause, the commission chief may have obtained a truce in the trade fight Trump started with the tariffs on steel and aluminium, putting him back in a rules-based framework. "Expectations were low, the result is excellent," the EU official boasted, insisting that it was achieved "without the EU jeopardising its economic interests, its values and its legislation." If so, Juncker would have given Trump a PR success, crucial with farmers ahead of the mid-terms elections in November, while securing the main prize - no trade war and a return to the table - and sacrifying steel and aliminium like a pawn in a larger game. "It is crucial to prevent a trade dispute with the US," noted Austrian chancellor Sebastian Kurz, whose country holds the rotating EU presidency. But pointing at the main challenge for Juncker's strategy, he added that "concrete details have now to be negotiated." While Trump may be comforted in his 'shock and awe' trade strategy, the EU commission, which is in charge of trade talks for the 28, will have to steer its way through the upcoming talks while still trying to obtain the end of tariffs on steel and aluminium. "Both sides have now a leverage," a source from a member state told EUobserver, insisting however on the need for reciprocity in the negotiations. "We'll see what happens," the EU official said. "Nothing is written in advance." EU commission chief and trade commissioner in Washington to avert a trade clash on cars, but Trump's tweets bode ill for the talks. 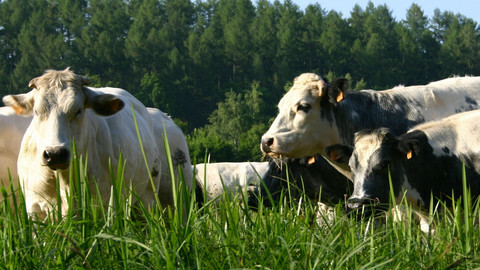 EU executive asking member states for mandate to help US producers get a better share of imports of non hormone-treated meat. 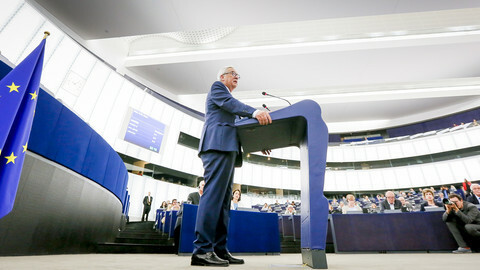 In his final State of the Union address, Jean-Claude Juncker warned of "exaggerated nationalism" in Europe - and said the EU should play a more dominant role in shaping world events, as the US withdraws from the global stage.